I saw a really cool post on Twitter this morning from Dave Harrison (@forestrydave) who talked about his plans to share the hobby with his kids from birth by using a different kind of mobile in their cribs. I thought this was very clever. What a fun way to share your love for the hobby with a youngster before they can even talk! I have two young sons myself and I have been slowly introducing them to the hobby. Okay, in some cases not so subtle. 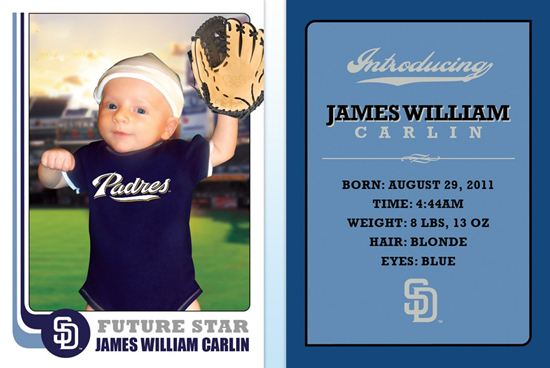 For my first son James I had baseball cards made up as birth announcements. Family and friends got a kick out of these and I saved a couple in case he ever makes it to the big leagues! I just know that trading cards brought me a lot of joy in my youth and eventually became my job so I want to share that with them. And that’s where it gets tricky for me when I go from being a father to a marketer because no matter how much we do with organizations that do sampling with kids like Cards2Kids or how much we spend marketing to kids at trade shows, ultimately collecting is a learned behavior that needs to be taught to kids. And nobody does that better than parents and shop owners. Collecting cards is an awesome hobby for parents to engage in with their kids creating memories that last forever, but it must be taught. So I posed the question today on UD’s Facebook page about when a good time to introduce collecting with kids was, I was encouraged to see dozens of quality responses from parents and shop owners. Here are just some of my favorites that I was inclined to share with other parents and shop owners who may find them interesting. Hopefully they provide you with the tools to share this wonderful hobby with the next generation of collectors! “It’s not about WHEN you introduce them to cards, it’s HOW. A parent who buys a box, opens a few packs a night and helps his kids put their first set together has so much more going fro them then just buying some packs for their kids and giving them to them. The parent gets to spend time building something they can share together for a lifetime. Talking sports and teaching about the game are things that will keep them close for years to come. Card collecting is taught, one collector to another.” Steve N.
“Trading cards have always been a great bridge between fathers and sons. It’s that first connection between favorite players, your favorite teams and chasing down that last card for a set, together.” – Carl N.
“I was so into collecting and had so many commons that I decided to wallpaper my basement walls with hockey cards. 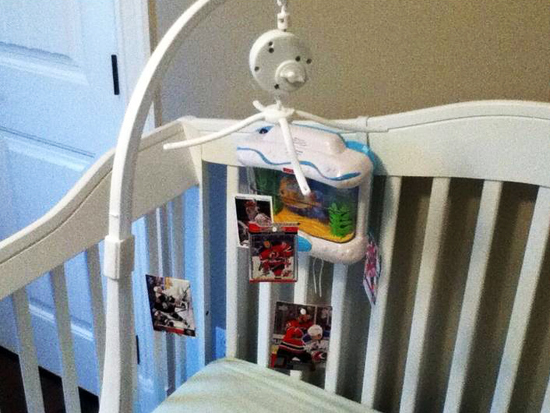 One day, I noticed my son had taped hockey cards himself to an opposite wall with the help of his mother. Ever since Alex has been opening hockey cards with me. There’s just something about getting that card you need to complete a set or that rare ‘Young Guns’ rookie card. It’s all about the happiness and joy of collecting and the memories you create together.” – Darryl M.
“It boils down to how much sports the child watches and is involved in at the time. If there are social activities where they can talk about their pulls from packs and the best players, then the child may be more inclined to collect.” – John V.
“I’m a math teacher and one time I bought the kids packs of basketball cards. I had them pick a player from the pack and use their states to do mean, median and mode.” – Daniel P.
“I remember the look on my sons faces when we opened pack, they were all smiles. As they got older the one way I got them interested was to have them help me read the cards. They both learned to read with the help of trading cards.” – Larry R.
Once kids learn about trading cards, they are all smiles! “My nephew is interested in anything that looks brightly colored and fun so we now play a memory game with the mini-jerseys UD produced. He can name all the teams and cities.” – Karine H.
“Two weekends ago I took my son to a show where current and former players were signing. After the show I think he truly started to understand what collecting cards and memorabilia was all about.” – Michael M.
“I got my son started on baseball and hockey cards at six. He would look, sort and read the cards and then watch a game. I also got entertainment cards for my daughter and she loved them. Now she has cards just like daddy!” – Erling C.
“I think it’s all about the bond that a common interest forms between a father and son. It’s never too early to start, nor too late.” – Maurice K.
“My son is 2 and I give him one each of all my commons. We sit and I tell him who each player is and what team they play for. I let him do whatever he wants to them, but when he gets careless I tell him not to be. He’s being raised in the hobby and one day he’ll grow to respect it.” – Andrew S.
“I tried my son at 5 and he was a bit too young still. He’s far more interested at 9 now that he plays organized baseball and watches our favorite team on TV. He had to learn more about the game and the players before it really sunk in.” – Mike B. “My son started showing interest around the age of 5. I always put together my commons from boxes I open and give them to the kids on my son’s baseball and hockey teams. I sort them out so all the kids get a couple stars in their packs. 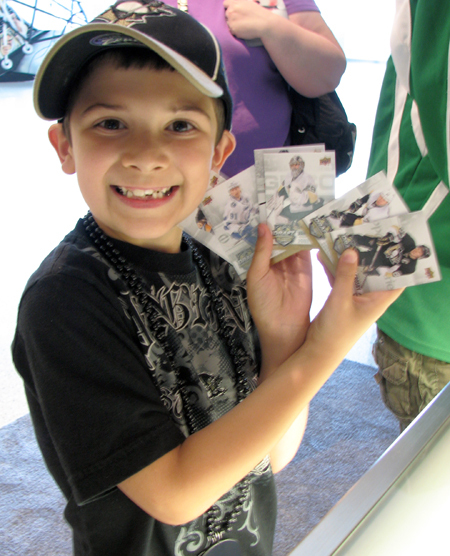 Everyone of the kids gets so excited and think my son is the greatest for giving cards to them.” – Jason S.
“My 4-year-old son knew all the hockey teams in the NHL by the time he was 2 because of hockey cards. U used hockey cards to potty train him. If he went on the toilet, he got two packs of cards. I went through a ton of O-Pee-Chee cards when he was doing this, but it was the easiest way to train him. 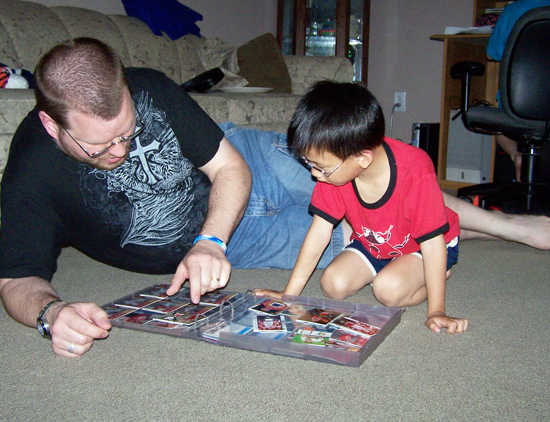 He loves all his cards!” – Todd H.
“I think trading cards are where my love of math comes from. Learning statistics and figure batting averages were a teaching tool for me.” – Allan A. Buying some cards and helping a child put together their first set is an idea that I really like. I remember when I was young and how I liked collecting sports cards with my own dad. Perhaps I’ll look into getting some basketball cards for sale online that I can get for my son and work with him to create his first set.